The Office is a Physical Medicine & Rehabilitation Center. We do Pain management of all areas of the body.Sports medicine. Osteopathic Manipulation is also offered. We perform injections such as trigger point/ joint injections under ultrasound guidance so there is no radiation involved. We perform injections of arthritic joints. We treat people with narcotic addiction/withdrawal problems using a new drug called suboxone. We perform Electrodiagnostic/ Nerve conduction studies (EMG). Spasticity management. 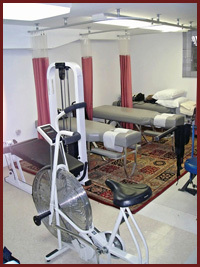 Our physical therapy area is fully equipped for rehabilitation of all body areas. An initial evaluation by the Physiatrist Dr. Adler will be performed after which a program will be tailored to fit the needs of the patient. Follow up and subsequent therapy appointments will be given by our courteous staff. Our Physical Therapy gym is equipped with weight machines, stationary bicycle, neck strengthening machine, Free weights, Single & Dual channel Electrical Stimulation machines, Hydrocollator (hot pack) machine, Ultrasound therapy machine, as well as various other equipment for therapy. Flushing Physical Medicine and Rehabilitation Center offers a multitude of services for your physcial ailments. Dr Michael Adler incorporates natuaral techniques such as heat, cryotherapy, electrotherapy, massage, and other practices in his physical therapy treatment. In addition, Dr. Adler is specialized in sports medicine and has helped patients rehab through injuries such as knee ligament tears, ankle sprains, back and neck pain, replacement surgeries and multiple other injuries. Dr. Adler treats patients from all over New York City, with multiple offices located in Flushing, Queens.